Everyone loves a good party. What’s the first step of planning one? Finding the right event venue. Toronto is home to so many cool spaces, whatever your neighbourhood, price point, and vibe you’re looking to capture. Good venues will book up months before busy season (think Christmas and New Years), when companies are having their year-end events. That’s why it’s important to do your homework well beforehand. 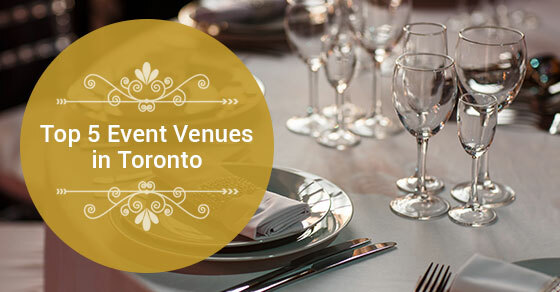 These five event venues in and around Toronto are a great place to start your search. Evergreen Brickworks is a well-known and loved event space in Toronto, hosting a wide variety of functions throughout the year. In the spring and summer, a huge number of Torontonians turn up for the Saturday farmers’ market and the Sunday artisan market. The Brickworks also hosts a Christmas market when the temperatures turn chilly. You can rent the Brickworks for your own event, too. It’s a well sought-after space for receptions and parties, offering up large halls in heritage buildings. The indoor facilities are lovely, but it’s really the outdoors that make the Brickworks special. The Evergreen Brickworks is nestled in the scenic Don Valley, and offers outdoor activities such as ice skating and tree planting if visitors are looking for a fun activity. The Brickworks is both a gorgeous event venue and a large scale community environmental space. The Château Le Jardin event venue in Vaughan is a rare taste of luxury in the GTA. It fully lives up to its “château” moniker, providing a stunning event space in a sprawling, historic building. The château is perfect for both weddings and corporate functions, and the staff are well trained in executing either. For weddings, there is great hall with a dreamy staircase, perfect for descending in a beautiful white gown. From meals to decor to music, everything is provided by Le Jardin. If you’re looking for an all-inclusive venue with experience hosting high-end events, you can’t do better than Château Le Jardin. Le Jardin also hosts bopping parties throughout the year. Stay tuned for their New Year’s bash! The Carlu is an Oliver Bonacini event space, so you know it’s going to be good! The Carlu is located in the heart of downtown Toronto and has plenty of history to its name. Not many event spaces can claim they’ve had royalty walk its floors. The architecture at the Carlu is classified as “art moderne”, a late type of art deco building style that emerged in the 1930s. Make no mistake though, the venue is in no way old fashioned. Some of the most significant social events take place in this space, and the quality delivered by O&B events is renowned throughout the city. If you’re looking for something in the downtown core, but still tucked out of the way, check out 99 Sudbury. The building is fairly nondescript from the outside, but that’s part of it’s hip, warehouse charm. The space has gone through a number of transitions throughout the years. It has been a restored glass factory, a trendy restaurant, and even an after-hours club. Today, it serves as a gym and event venue. 99 Sudbury is both the name of the venue and its address; it’s located right in Liberty Village, a stone’s throw from either Queen or King Street, west of Bathurst. Passersby will note the bumping sounds and uproar inside. 99 Sudbury is known for throwing creative events for a fun-loving crowd. If you want to give your next event a distinctly cool and urban twist, 99 Sudbury could be your perfect venue. Don’t take our word for it, though. A past guest list of Google, Facebook, J. Cole, and Lady Gaga say enough. Nothing melts a Torontonian’s heart like a stunning view of the skyline and the water. That’s what you get when you book The Globe and Mail Centre. The Globe and Mail Centre is located at 351 King Street East on the 17th floor. It’s the perfect space for a corporate event; close enough to the financial district that guests won’t be going terribly out of the way, but far enough east that the neighbourhood has morphed into a distinctly different scene. The space is open, minimalist, and gorgeous. Hardwood floors, floor-to-ceiling windows, and a stunning view are enough to sell this space to many companies looking to host media events, receptions, and conferences. There’s no better way to get inspired than to enjoy the results of everyone’s hard work with a clear view of the CN Tower. Toronto is truly rich with elegant, modern, and service-oriented event spaces. Whatever the type of event you’re looking to host, you can be certain to find an option that fits your capacity needs and budget. From luxurious chateaus to modern flats, there’s a fitting venue for any occasion. Now it’s on to planning the catering! An amazing event starts with a stunning space. For more information about Toronto’s premier event venue, contact Le Jardin at (289) 236-2572 today or visit us on-site at 8440 Hwy 27 in Woodbridge, ON.